Soile Isokoski is recognized as one of the world's finest lyric sopranos and regularly appears on the most renowned stages and concert halls. 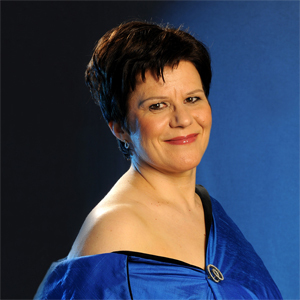 After graduating from the Sibelius Academy, she gave her début recital in Helsinki in 1986 and subsequently won a number of important international singing competitions. She made her début at the Finnish National Opera as Mimì in Puccini's La Bohème and has since delighted audiences and critics alike at opera houses in Vienna, Berlin, Munich, Hamburg, London, Milan and Paris, at The Metropolitan Opera and at music festivals in Salzburg, Savonlinna, Edinburgh and Orange. Soile Isokoski has worked with numerous distinguished conductors such as Jukka-Pekka Saraste, Esa-Pekka Salonen, Seiji Ozawa, John Eliot Gardiner, Sir Colin Davis, Zubin Mehta, Daniel Barenboim, Sir Simon Rattle, Bernhard Haitink, Riccardo Muti, Claudio Abbado, Valery Gergiev and James Levine. Her recent opera roles include Die Marschallin (Der Rosenkavalier), Eva (Die Meistersinger von Nürnberg), Donna Elvira (Don Giovanni), Alice (Falstaff), Margarethe (Faust), Rachel (La Juive), the Countess (Le nozze di Figaro), Desdemona (Otello), Liù (Turandot), Elsa (Lohengrin), Fiordiligi (Così fan tutte) and Ariadne (Ariadne auf Naxos). She has an extensive concert repertoire, and she regularly gives recitals with her permanent accompanist Marita Viitasalo. Soile Isokoski's recording, for Ondine, of Luonnotar and other orchestral songs by Sibelius with the Helsinki Philharmonic Orchestra under Leif Segerstam won the 2007 BBC Music Magazine Award ‘Disc of the Year', in addition to a MIDEM Classical Award (ODE 1080-5). Her rendition of Four Last Songs and other orchestral songs by Richard Strauss with the Berlin Radio Symphony Orchestra under Marek Janowski received a Gramophone Award in 2002 (ODE 982-2). Her 2006 Christmas album Jouluyö, juhlayö, featuring also the YL Male Voice Choir, became a gold-winning best-seller in Finland (ODE 1088-2). In honour of her notable contribution to Finnish music, Soile Isokoski was awarded with the Pro-Finlandia medal in 2002. In September 2008, she received in Vienna the honorary title of "Österreichische Kammersängerin".